Bristol Rovers boss Darrell Clarke says he understands why assistant Marcus Stewart is being linked with the vacant managerial position at Yeovil Town. Paul Sturrock left Yeovil on Tuesday after eight months in charge. Stewart, 43, who previously played for the Glovers, is the bookmakers favourite for the job at Huish Park. "Marcus has aspirations be a manager," Clarke told BBC Radio Bristol. "I understand why Marcus has been linked to it as it is his old club." 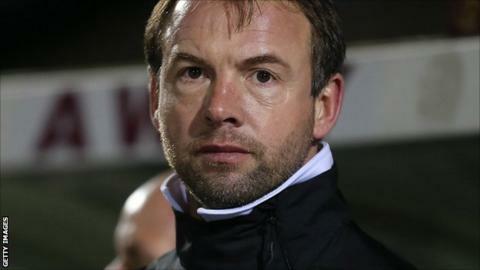 Speaking to BBC Somerset, former Yeovil boss Gary Johnson ruled himself out of the running. Clarke says Stewart has not spoken to him about the role at League Two's bottom side but does not doubt his desire to a manager one day. "I have not has a conversation with him," he said. "I have a really good backroom staff, we have a really good team and good physio. I don't know how to comment on it, he does want to be a manager no doubt." Yeovil, without a league win in 12 games, have placed Darren Way in temporary charge. He called for unity at the club as they attempt to avoid a third successive relegation. "I want a group of players that are going to pull together as a team, I don't want a team of individuals," Way told the club website. "This will not make us win every game but will certainly make us better in the long run. "I think that working for Yeovil Town Football Club should be a privilege. It is now up to myself and the players we have here to prove to the fans that they are privileged to be at Huish Park as football can change quickly. "I would love for the players and staff to bring the supporters closer together with the club as I feel for a long time now that the togetherness has not been there. I know the only way we can do that is by winning games."